Curaçao Tourist Board, Curaçao Airport Partners and Hotels of Curaçao host successful event. 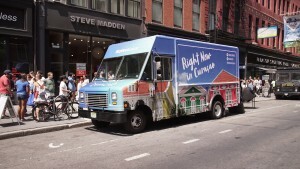 WILLEMSTAD – This past week, the Curaçao Tourist Board, Curaçao Airport Partners and hotel members from the Curaçao Hospitality and Tourism Association successfully completed another promotional roadshow in New York City. As part of the events, the organizations hosted a “batido truck” pop-up event in the Flatiron district and Union Square, two of New York’s most high-traffic areas. With the goal of reaching and engaging New York consumers, the organizations planned an attention-grabbing stunt. The event was designed to create awareness of the island and provide New Yorkers with the opportunity to learn about Curaçao, interact with the island partners, enter to win a trip giveaway and enjoy a signature Curaçao batido. On August 24th, the batido truck was parked behind the iconic Flatiron Building, and on August 25th, the roaming batido truck was parked along Union Square. Adorned with the words “Right Now in Curaçao,” corresponding with the tourism board’s new marketing and advertising campaign, the vibrant batido truck was an eye-catching spectacle. While staff and employees handed out free batidos, island partners had the chance to tell New Yorkers more about the island and the nonstop flights on JetBlue, as well as pass out branded swag. Several trip giveaways were presented on-site with another two winners to be selected through an online and social media contest. As a result, the events created a flurry of social media engagement, as locals were encouraged to use the special event hashtag, #RightNowInCuracao, and use the Curaçao-branded Snapchat filter. During the two days, more than 3,000 New Yorkers enjoyed a batido with another 600,000 exposed to the island through social media. Thanks to the successful marketing activation, Curaçao is gearing to become a top-of-mind destination for New Yorkers.